Army Staff Sergeant Luis Chavez and his wife Nancy experienced spiritual renewal during Operation Heal Our Patriots. 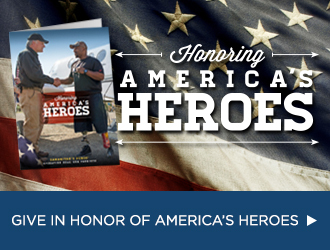 The deployment to Iraq was already marked by tragedy for Army Staff Sergeant Luis Chavez. Within a matter of only a few weeks six fellow soldiers were killed and his company commander was seriously injured. Then Luis’ life was also threatened. “We got hit by IEDs a couple of times. One of those times we rolled the vehicle,” Luis explained. His back was severely injured and would require extensive surgery. After that he would endure weeks of excruciating physical therapy. Sadly, he would soon learn, his military career was coming to an end. He returned from war physically battered by his own injuries and emotionally wounded from losing so many friends in combat. He became dependent on his wife to care for him and to hold their family together. Army Staff Sergeant Luis Chavez and his wife Nancy are welcomed as they arrive at Samaritan Lodge Alaska. Luis never wanted to put Nancy through such hardship. It wasn’t the life he’d envisioned for his high school sweetheart. “I knew she was the one I would marry—I always knew,” Luis said. Luis and Nancy married after dating about five years, with deployment interrupting any chance for wedded bliss. Nancy moved back to Texas to be with family and anxiously awaited her husband to come home. His return was nothing like she’d expected. To cope with what he had experienced in combat, Luis began to self medicate with alcohol. Luis enjoys fly fishing in Lake Clark. The back injury continued to bring Luis pain and his heart remained torn between his former life in the Army and his new life as a civilian. Luis’ drinking and persistent silence eventually became too much. “I tried to avoid the problem since I couldn’t fix it,” Nancy said. Over time, the couple eventually worked through some of their marital struggles. Yet, when they arrived in Alaska for a week with Operation Heal Our Patriots they still had plenty of healing left to do. During their week at Samaritan Lodge Alaska, Nancy and Luis bonded through activities such as bear watching, fishing, and hiking. And as they began to learn Biblical principles for a healthy marriage through marriage enrichment classes and discussions with chaplains, the Chavezes understood that they also needed a heart change. Throughout the week Nancy and Luis met with chaplain Dan Stephens and his wife Linda. They were reminded of the hope and power of the Gospel to transform their lives. As they experienced this again at Samaritan Lodge, the couple rededicated themselves to following Jesus Christ. They also rededicated their marriage, joining six other military couples that week to participate in a special marriage rededication ceremony on the shores of Lake Clark. Luis, who initially had doubts about participating, is thankful for the time he had with his wife to strengthen their marriage. 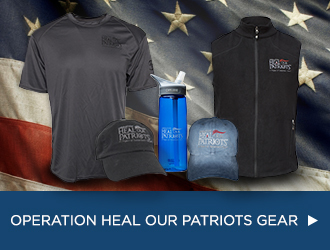 Please continue to pray for the remaining weeks of Operation Heal Our Patriots. Please pray for marriages to be restored and for military couples to come to faith in Jesus Christ. Military couples like Luis and Nancy bond during activities such as hiking. Operation Heal Our Patriots is a special time for couples to enjoy time together and to focus on strengthening their marriage.